What's the current weather of a particular airport? Click here to find out. Taking the point of view that good rules make good programs, this book presents proven strategies for using and programming in the C++ object-oriented language in the form of easy-to-follow lists of rules and recommendations. 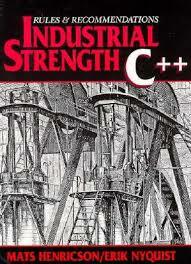 This book greatly expands the public domain "Ellemtel" C++ coding standard. Guidelines have been carefully selected and consisely formulated to define a C++ coding standard that should be valid and usable for almost all programmers. Text and code examples explain each individual rule and recommendation. Adopting this book as the company C++ coding standard helps remove an obstacle when trying to be certified for ISO 9000 or CMM. The book covers naming conventions, code organization, resource management, class interface design, object-oriented programming, conversions, error handling, portability, coding style. Bartosz Milewski is the president of Reliable Software, a company that creates high-quality productivity tools for programmers. His work has been widely published in major journals over the past several years. During his eight years at Microsoft, he was the development lead of the Content Index component of Windows 2000. He has taught C++ programming at the University of Wroclaw in Poland and holds a Ph.D. in theoretical physics from the University of Wroclaw.